Wizards Update: Just How Good Are They? While fans worried during Washington’s three-game losing streak over the past week, the Wizards completed a successful road trip against Western Conference opponents with wins over Houston and New Orleans. Entering the trip as decided underdogs in all five contests, the Wizards were competitive in all but the Dallas game — which came the night after a gritty win against the Rockets. Upon completion of the trip, I updated my “who’s gonna win” calculator and projected the Wizards’ final record. At the Washington Post this week, columnist Thomas Boswell did a nice job explaining why the Wizards aren’t as good as their record. Everything Boswell wrote is valid and correct, but…being in the Eastern Conference this season is incredibly fortunate for a middle-of-the-pack team like the Wizards. Based on season performance through last night’s games, I estimate Washington will finish with 51-54 wins — the best season for the franchise since the mid-1970s. Age — Many seem to think this is a young team, but it’s not. They have the league’s 7th oldest rotation, and they’re reliant on 30+ year olds in key roles — including the 38-year old Andre Miller and the 37-year old Paul Pierce. And there’s Nenê, whose play has declined the past couple years as he’s suffered through a series of nagging injuries. No elite producers — I can hear the screens breaking all over the DC area. What about John Wall?! He’s an All-Star, a top five PG, and you wrote last week that he’s the league’s best defensive PG. Well, some of that is true. But, good as Wall has been this season, he’s still well behind the game’s elite players when it comes to doing things that cause a team to win. As I’ve pointed out previously, Wall does a lot of good things when he’s on the floor, but…he also does a lot of things that hurt — specifically turnovers, missed shots and poor shot selection. To become an elite team, the Wizards need him to play even better than he already has. Kevin Seraphin — The coaches keep playing him, and in games against weaker opponents he doesn’t hurt too much. Against better teams, it hurts to have Seraphin in the lineup. That was apparent in the loss against Oklahoma City. In a game the Wizards lost by seven, they were -11 when Seraphin was on the floor. For those who don’t want to do the math, that means Washington was +7 when he was on the bench. Lack of Progress from the youngsters — I’m a big fan of Bradley Beal and Otto Porter, but both guys have been pretty average so far. Beal’s 102 PPA (see below) is a modest improvement, but is below average for a starter (125). Porter has been okay as a backup, and is performing at a level similar to that of players with similar collegiate production. Neither guy has demonstrated they should be considered foundational players for the Wizards. And, I think Washington will need one of the two (preferably Beal) to make that leap this season if they hope to reach the conference Finals…or more. Coaching — Encouraged by head coach Randy Wittman, the Wizards continue to take too many two-point jumpers. Sometimes they’re necessary, but the math is abundantly clear that they’re bad shots — exactly the ones the defense wants them to take. No major surprises considering the team went 2-3 over the past week. 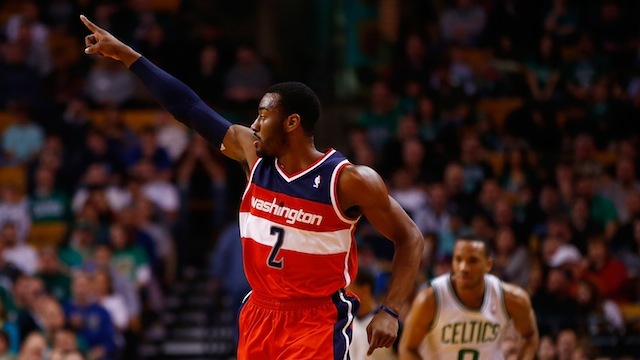 Wall took over the top spot in the team’s PPA rankings because Gortat’s play dropped further. Rasual Butler’s anticipated reversion to the mean is in progress. Hopefully, Beal’s play will improve as Butler’s dips. Seraphin held steady…below replacement level. For the first time in weeks, the Wizards dusted off DeJuan Blair, and he moved his PPA out of negative territory. Martell Webster looked terrible in his return from back surgery.